Mohamed Buttu is a retired transit worker and Palestinian citizen of Israel. The Palestinian Nakba Wasn’t Just a Historical Event. It Has Continued Unabated for 70 Years. 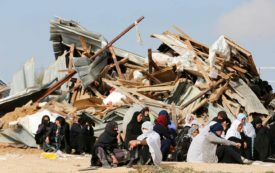 Israel continues to steal Palestinian land, revoke residency rights, and destroy Palestinian homes so that Jewish Israelis can live in their place.